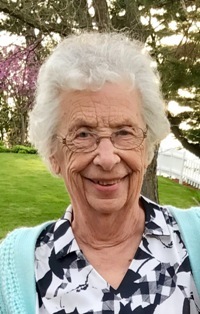 Mary Margaret (Davis) Manke, 92, of Bangor, died Saturday, February 09, 2019 at the Morrow Memorial Home, Sparta. She was born at home on November 4, 1926 to the late Robert and Dorthea (Niedfeldt) Davis in the Township of Bangor. Mary attended Bangor High School. Following high school she and her sister, Ruth went to the Business Institute of Milwaukee. Mary and Ruth loved to sing, together, they sang at numerous weddings. She married Raymond Manke October 7, 1948. They farmed together in the Bangor area until 1976. He preceded her in death in 1995. Mary continued to go to the farm until she was 87, driving out at 5:30 a.m. daily to feed caves and barn chores. Mary is survived by, Stanley (Patricia Garves) Manke; and Robert (Patricia Anderson) Manke; her grandchildren, Jacob (Maggie) Manke; Hilary (Mike) Eichacker; Daniel (Cortney) Manke; and Paula (Chad) Anderson. She is further survived by her great-grandchildren: Mollie, Zach, Michael, Jeremy, Jamison, Jaxon, Tristan, Faith, Abigail, Alex, Bryce, Grant, and Wyatt; siblings, Ruth Stratman and a brother, Robert (Casey) Davis. She was preceded in death by her husband, Raymond; parents, Robert and Dorthea; an infant son, Steven in 1951; siblings and inlaws, Wilhelmina (Hilbert) Weinke; Lydia(Raymond “Curly”) Wehrenberg, Lillie (Oscar) Olson; Fritz (Millie) VehrenKamp; Maynard Stratman; and Myrna Davis.